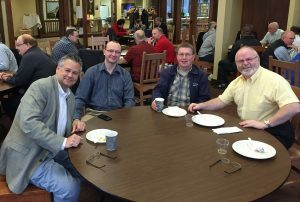 Our Men’s Group is built on a program called, “That Man is You,” a national program that is DVD-based, incorporating small group discussion. For many men, it’s a program where they can find direction, real world answers, and a group of men who share the same struggles. The group meets weekly with a light breakfast, watch a 30 minute DVD presentation, and gather in small groups to discuss afterwards. No fees are involved, voluntary donation only. All are welcome, feel free to just drop in and check it out: We meet Thursdays 6:00 AM-7:30 AM or Saturdays 6:45 AM – 8:15 AM. Balancing commitments to faith, family, and work can sometimes seem to be an impossible task. How can these very important but distinct areas of life be reconciled? At Men of Christ, it begins with a deeper and more solid understanding of our Catholic faith. Each year, Men of Christ holds a conference to start this process of understanding the faith. The goal of the Men of Christ Conference is to improve men–to make them courageous leaders–and to provide answers to these difficult life questions. The 2016 Conference Date was Saturday March 12th and we had a blast! Stay tuned for the 2017 conference date (tentative for March 11th, 2017). For more information go to www.menofchrist.net. If you have any questions contact Mike Nuzzo at 262-515-4836 or mikenuzzo52@gmail.com.